The Commission for Language and Culture of COMITES is happy to announce the opening of the call for Maria Manetti Shrem Grants 2018. Students who take the AP Italian Exam 2018 and score 3 or higher will be awarded with prizes from 50 to 100$. This initiative is possible thanks to the generosity of Ms. Maria Manetti Shrem, a stellar lover of Arts and Culture and well acclaimed Philanthropist of California. 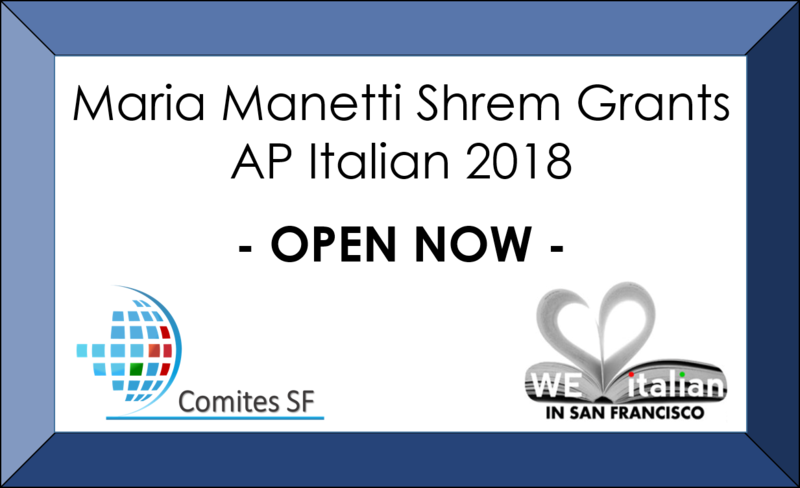 Ms. Maria Manetti Shrem’s generosity paired with COMITES in an effort to promote the growth of the Italian Language and Culture in Northern California and beyond. Are you getting ready to take the AP Italian Language and Culture Exam on May 16 2018? Are you teaching an AP class of Exam takers? Fill out the form for your students. Submit the application no later than 30 April 2018.